The moderates have much more room than the value resorts, more amenities, and (except for Fort Wilderness) much better landscaping. See this for what you get by Disney World price class. 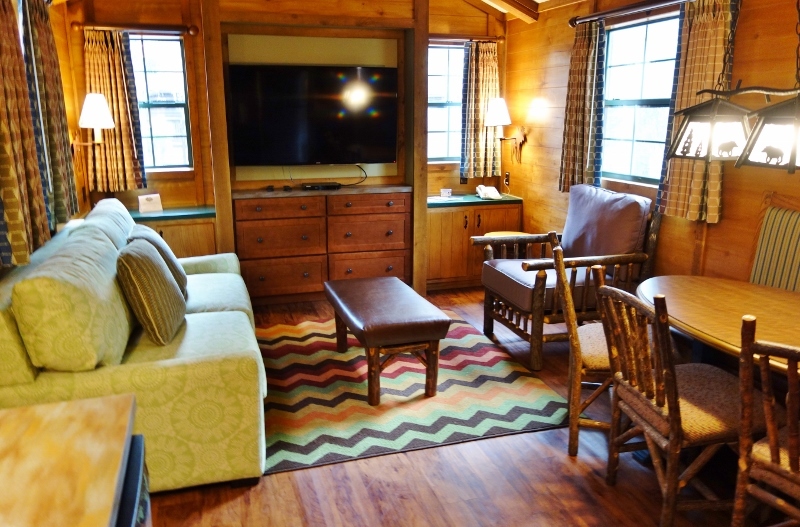 The Cabins at Disney’s Fort Wilderness Resort were refurbed in early 2016, except for Loop 2100, where the cabins were removed. The cabins are distinctive among the Disney World moderate resorts for several reasons. 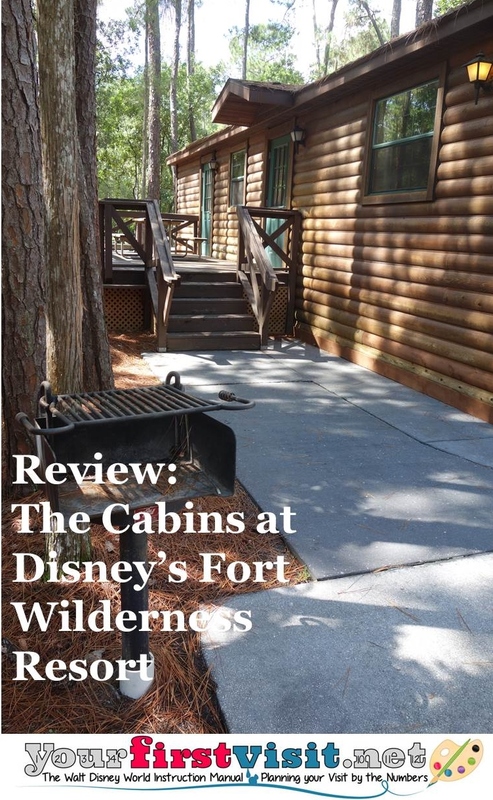 Because of these negatives, based on our January 2016 visit (our fifth stay in the Cabins since I started this site, and second in a refurbed cabin), the Cabins at Disney’s Fort Wilderness Resort remain the fifth best of the moderates for first time family visitors. That said, the moderates do represent almost 30% of the room capacity of Walt Disney World, and will be sought by some you regardless of this site’s advice, or because this site’s recommended resorts are sold out. 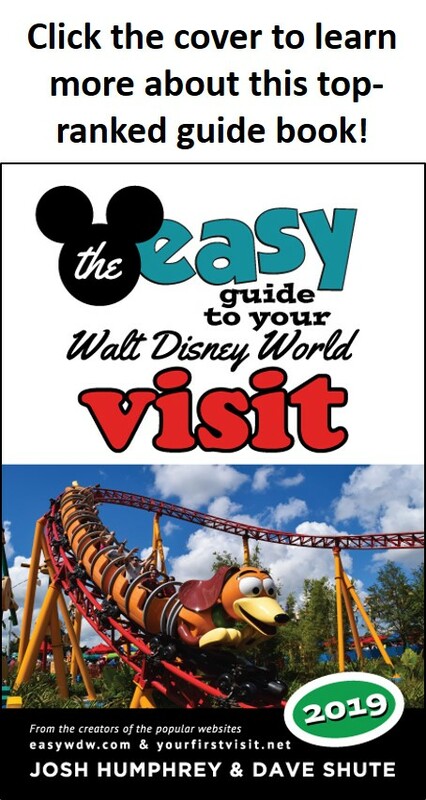 Note that the long-time travel agent partner of this site, Kelly B., can help you book your Disney World vacation at The Cabins at Fort Wilderness or anywhere else–contact her at at KellyB@DestinationsInFlorida.com or 980-429-4499. Resorts are ranked on this site for first time visitors based first on their kid appeal, and then on their convenience. 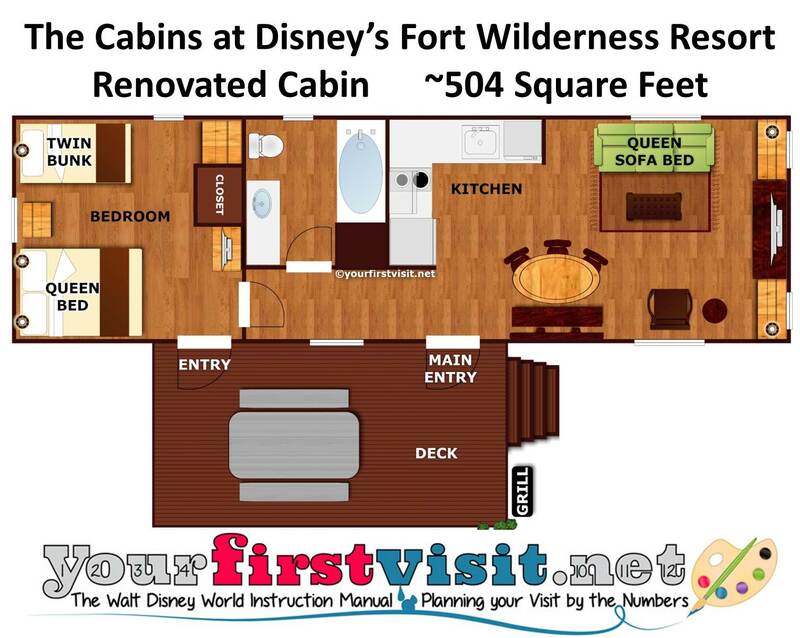 On this basis, the Cabins at Disney’s Fort Wilderness Resort are the least good moderate resort for first time family visitors. As you can see from the image above, the Cabins are long narrow buildings that share no common walls or floors/ceilings with any other family’s space. Parking is in front, and you’ll find a barbecue grill near it, and then steps up to a large deck with a picnic table. From the deck (dark brown in the floor plan of a refurbed cabin), there’s two entrances into the cabins. The one closer to the steps is the main entry–it’s the one with the MagicBand lock. It opens into a small kitchen, with a refrigerator/freezer, sink, dishwasher, two burner stove combo, microwave/oven combo, coffee pot and toaster. All the basic kitchen supplies–from steak knives to coffee cups to frying pans–are here as well. At the end of this hall you’ll find the bedroom. The second door from the porch opens into this room, with a dead-bolted, rather than keyed, door. This was handy to leave open while grilling or using the deck’s picnic table, but a bit of a security concern otherwise. In this room you’ll find two bunk beds and a queen bed. The bunk bed mattresses are 66 inches long by 39 inches wide, and sleep a little shorter than that as they are enclosed by rails. You’ll also find in this space the only real closet. The theming of this resort, while charming, is so subtle that it will miss most kids entirely. 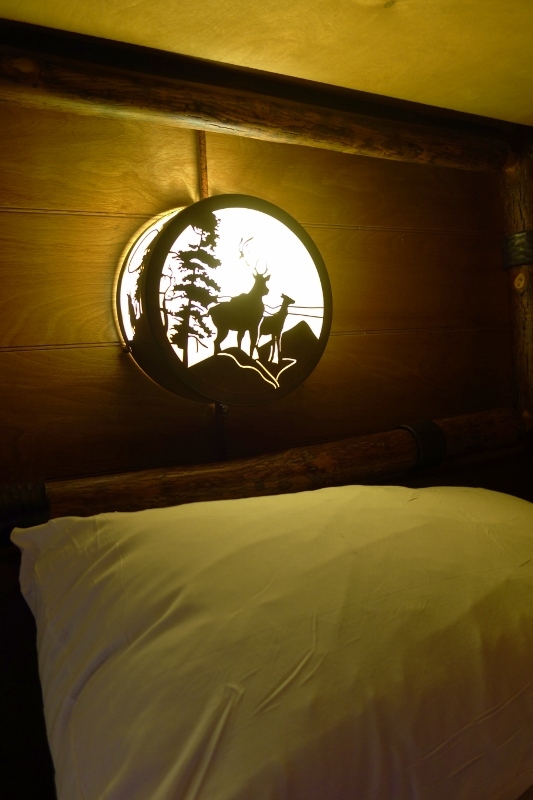 Yes, it’s at a great campground, and yes, the Cabins are charmingly rustic. The main pool (at right) was renovated in 2009, and theming and a slide were added. It’s much better than it was, but still not great. 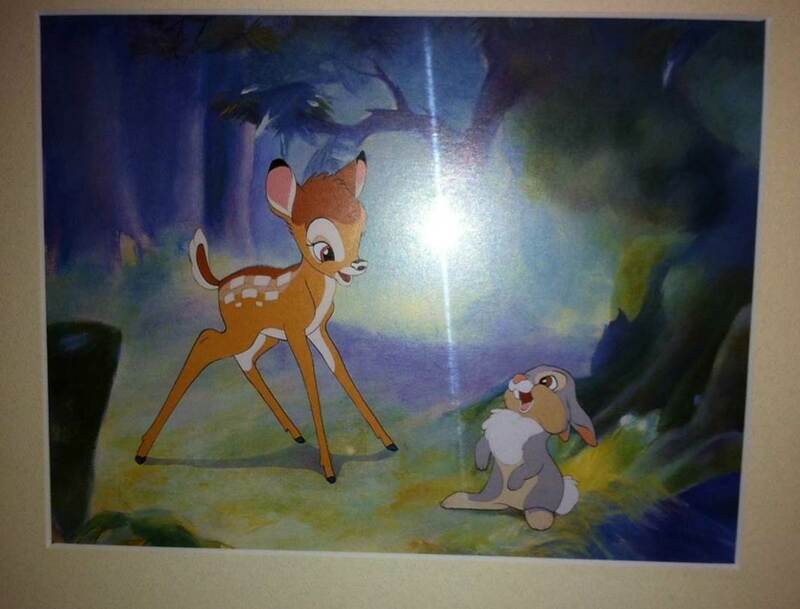 …and this wall art of Bambi and Thumper (and my camera flash) in the back hall. But overall, the theming is not nearly so strong as that at the other moderates, and as a result, the comparative kid appeal is slight. 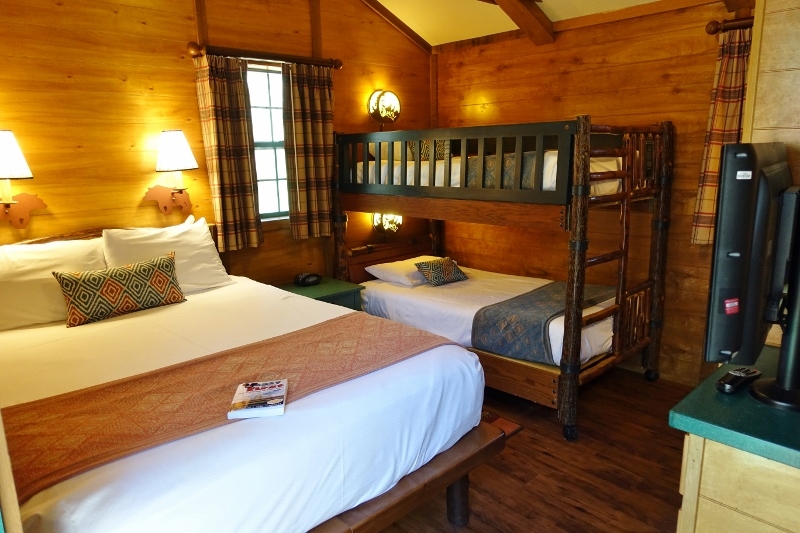 The Cabins at Disney’s Fort Wilderness Resort are remarkably inconvenient even compared to the other moderates, which can be a pain to get around. While often thought of as out of the way, the resort is actually located just across Bay Lake and Seven Seas Lagoon from the Magic Kingdom. Its inconvenience comes not from its location but rather from the internal bus system that the sprawling Fort Wilderness Resort uses. To get to any theme park, two transportation actions are required—an internal bus to the appropriate transfer point, and then an external bus to the park itself. This can easily add half an hour or more to daily transportation times—adding up to a lost afternoon or so over the course of an eight-night visit. 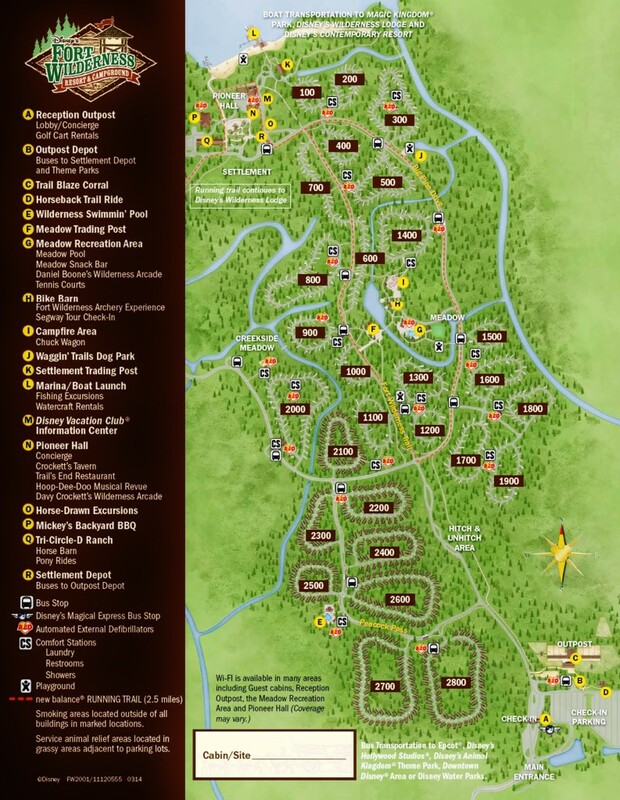 See the map of Fort Wilderness (click it to enlarge). The Cabins are in the lower center, loops 2200 through 2800. The Outpost, at the bottom of the map, where you’ll find the rest of the theme park buses and the concierge services. None of the Cabin loops are anywhere near the Settlement. Loop 2200 is closest to the Meadow. Loop 2800 is closest to the Outpost. The other loops aren’t particularly close to anything other than the quiet pool in the middle of this area, near Loops 2500, 2600, and 2700. For most families, 2200 is the best choice, for relative closeness to the pools, sing-alongs, and shop of the Meadow. Disney lets you select loop preferences when you do on-line check-in. See the image for the options you’ll be presented with. 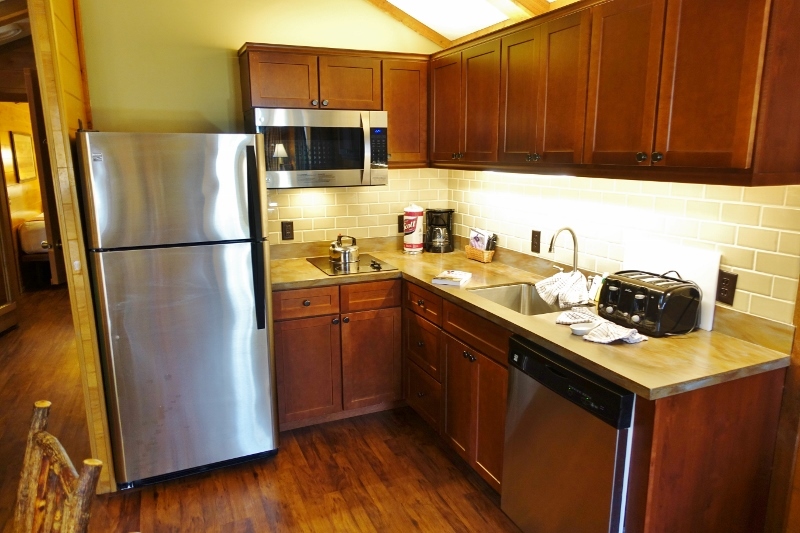 Six person families seeking a full kitchen at lower prices than at the DVC resorts. Families with mobility issues; families with several taller members; families seeking a convenient resort; families seeking a particularly kid-appealing resort. The long-time travel agent partner of this site, Kelly B., can help you book your Disney World vacation at The Cabins at Fort Wilderness or anywhere else–contact her at at KellyB@DestinationsInFlorida.com or 980-429-4499. How far is the walk between the 2100 loop and the pool? We have a 2.5 and 4 year old and are about to make our room request. We’d like to be able to walk to the pool but if it’s far enough and we’d probably end up taking the bus anyway then we might prefer the 2500 loop to be close to the quiet pool. Thanks so much! As the crow flies, it’s about 1200 feet from center to center, Anne–about a quarter of a mile. So with twists and turns figure less than half a mile. Hi, I am wondering if it would be a good idea to stay near the quiet pool with little ones, ages 1 & 2. We will have a golf cart to get around. Marilyn, at that age they won’t much care where they are. It’s hard to manage such young kids in a golf cart (unless you have three adults, two to hold them, one to drive) so aiming for near the quiet pool is a good idea–shorter walks. I’m thinking about booking a cabin. It seems that they are a very long walk from the boat launch, which would have been our preferred method of travel. Could you clarify how long the walk is from the cabins to the launch? Additionally, what method of transportation would you recommend to get from the cabins to the Magic Kingdom, and how long should we allow? we have 11 in our group. I have reserved 2 cabins. Would I be wise to try to book loop 2500 so some of our group could use the comfort station to shower since the hot water supply in the cabins is minimal. Any other suggestions would be helpful. Diana, that’s a great idea! We reserved a cabin for October. We will be bringing our two 4 year old grandchildren and thought the cabin provided us the maximum space needed. There are a few things I’m curious about. 1. We will be driving and already have a golf cart rented. Is that overkill – do we need a golf cart if we have a vehicle? 2. I saw where you said the internal transportation is a pain. Do we need to use this if we have a golf cart? 3. Does the golf carts have enough space to bring a double stroller? This is our first time driving to Disney. In the past we’ve always flown and has been 100% dependent on Disney Transportation and liked that I didn’t have to worry about parking. Since we are taking a vehicle, I don’t know if we should plan on using that to go to all the parks except MK. Thanks for any advice and suggestions. Mary, what you likely want to do is use your car for the parks other than MMK, and use either your cart or the FW internal bus to get to the dock for the MK boat. You would then use your cart to also get around FW. The carts have two bench seats. If one of you plus the kids sits in the back one, then you can put the stroller next to the driver in the front seat. Dave, can you reserve a golf cart through WDW prior to arrival? What is the cost? Hi Ralph – Golf carts are available for rental at the Reception Outpost. Advanced reservations are highly recommended. You can do this by calling 407-824-2742. They are currently $59.00 per day ( Guest must be 18 and older to rent, 16 and older to drive. All guests must have a valid drivers license and have it with them while operating the vehicle). Rental pick up time is 1pm and must be returned by 11am. Great site, thanks for all the insight. I have a cabin reserved for February 2017, we’re a family of five (wife and 3 daughters) going on our second trip (first for the youngest one) and taught that spacewise the cabins will be a great option. I’m getting worried about the transportation, I’ve been reading and it sounds like is somewhat difficult and lenghty to get around. On the same dates, the Contemporary is about $80 per night more than the cabins. I know we will be tighter in the room, but is it worth it for the ease of transportation to stay on the Contemporary instead? I will really appreciate in your insight on this. Thanks in adavnce!!! Alfonso, the Contemporary rooms you are pricing are Garden Wing rooms which have their own challenges–no balconies, and for many distance from the main tower services, including its transportation. If you don’t have a rental car, FW on average will add about 40 minutes a day to your transport. With a car, you can drive to AK, Epcot and HS (MK is still best via bus then boat) and have better times to these parks than either hotel without a car. I too I’m getting concerned about the transportation and the internal bussing and feel we should have booked a different hotel. We are flying and will be there the first week of September. We plan to stay at the park mostly all day. Would it be best to rent a golf cart or just trust the internal busses? Thank you for you help. Also which loop would be best to request for our three kids? Hi Ann, a rental car would be a better choice than a golf cart–about the same prcie, but much faster to EPcot, HS and MK. (Still use the bus/boat for MK). Among the cabin loops, as noted in the post, for most families, 2200 is the best choice, for relative closeness to the pools, sing-alongs, and shop of the Meadow. Thanks for your helpful post. I just wanted clarity on 2 points. One, is the only place to catch the Disney buses that take you to the parks at the outpost? 2- we are driving to Disney and will have a car so if our cabin is far from outpost can we simply drive and park our car in outpost area and take Disney bus to park? Just want to make sure there is free parking at Outpost. Oh Lauren, sorry, I misunderstood you. This changes now and then, but right now yes, buses to AK, HS and Epcot are at the Outpost, and you can park nearby for free. This is discouraged, as it limits parking for those coming to the Fort for a visit to e.g. Hoop Dee Doo Revue. We are looking into these cabins for next year. It will be my husband and so along with our 5 year old and 2.5 year old and my parents. My boys love the outdoors and having space to run around plus having all of us stay on one place definitely saves money. We will be flying, but my parents will be driving so we will have a car and groceries. It will all be our first time. Is the pull out bed comfortable? Is there anyother places you would recommend other than this for our needs or is this probably our best option? Thank you! Hi Nikki – I can’t attest to the comfiness of the mattress (I’ll let Dave answer that), but the Cabins seem like a perfect fit for your family. One of the most economical choices. Full kitchen for Dining. Do understand the size of the resort. I always suggest that my clients rent a golf cart (or two) to get around. And while the kitchen is a great asset, planning to do at least your midday meal in the parks is usually the realistic choice. While a 30 minute break for lunch is what you have in mind, that turns into quite a bit more. You’ll need to include time to exit the park, wait for transportation (if using the bus), travel. Navigate the resort back to your cabin. Prepare the meal. Clean up and do the same in reverse. That 30 minute meal just took 2-3 hours out of your day. I would be more than happy to help you plan your upcoming vacation. Disney has not yet released it’s 2018 prices (we are expecting those mid-late June). All of my planning services are free when you book a Disney vacation package with me and Destinations in Florida. Please feel free to contact me at KellyB@DestinationsinFlorida.com or 980-429-4499. Hey there! Love your website. It has been so helpful. We are planning our fourth visit to WDW in June 2018. We will be visiting with extended family for a total of 16 people, all over the age of 16 except for one 10-year-old. My family (four people) will be bringing our camper (no tent) . The rest of the party will be staying in two cabins. I am thinking we should request Loop 2100 for our camper, and loop 2200 for the cabins so we can be somewhat near each other. Also, “Gramps” has some trouble getting around because of a knee replacement several years ago, so we are thinking of renting a golf cart, simply for getting around the campground. My understanding is that we can drive the golf cart to the boat launch area for MK and to the bus pickup area for the other resorts? Am I correct? Hi Angie, yes to both! This year we spent a week in the 2400 section of the park. Walking to the bus stop was no issue, nor was the wait time for the buses. I will say that it was the best week that I have ever spent. I use to travel alot and would stay in extended stays or suites at hotels, this was by far way beyond that for me. We had 6 people in the cabin 4 adults and 2 children 5 and 10. Nobody felt cramped at all except at dinner time with only 2 burners to cook on but they did have a microwave / convection oven available. The fold away bed gave me a great sleep. I say this because I would normally count dots on the ceiling at bed time, but within a few min of laying down on that bed, zonk!. I went as far as trying to figure out how i was going to get it on my van and out of the park without anyone noticing LOL. Recently stayed in the cabins.1 adult and 3 teens. We never ran out of hot water. It was a wonderful trip! The buses came by quickly no matter what time we set out and everyone enjoyed the boat ride to MK! Great, Stella, and thanks for the report! 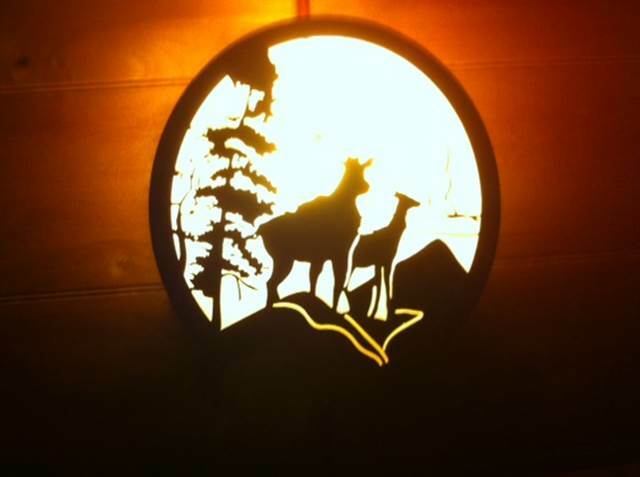 Looking at booking this for the fall and wondering how close are the cabins in proximity to the Lodge? Also, in years past, have the cabins been included in room only discounts? 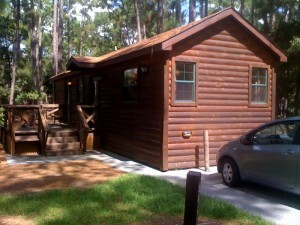 I would like to stay in the cabin for outdoor activities, no parks this time, do you recommend it? my daughters want horse riding, how this works? 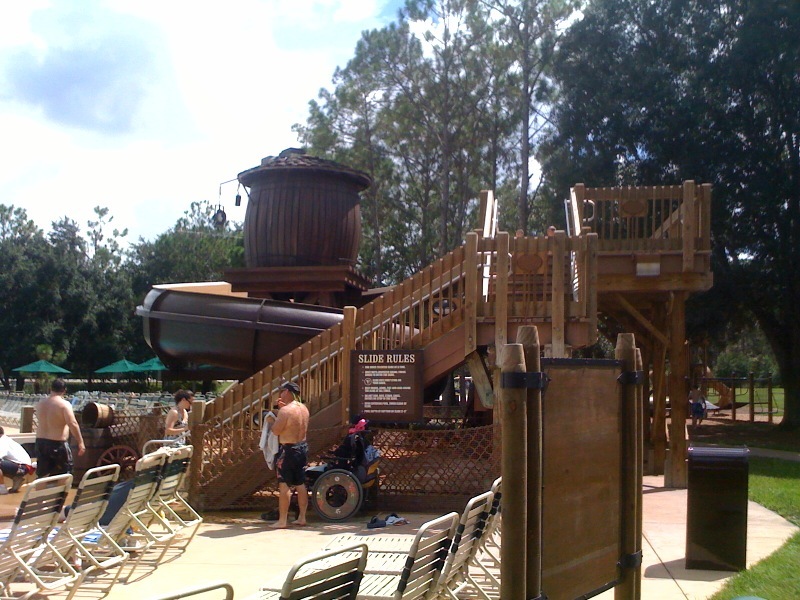 Fort WIlderness is a lot of fun, and it’s not uncommon for folk to have a non-park vacation there.